Serve with Organic Brown Rice. Place the onions, carrots, potatoes, jalapeño, peppers and chicken.In your 4-6 quart crockpot/slow cooker. In a bowl, stir/whisk together the coconut milk, coconut sugar, garlic, ginger, turmeric, curry powder, coriander seed, salt, black pepper and red pepper flakes. Whisk until combined. Pour the mixture over the contents of the slow cooker. Stir ingredients throughout cooking time— if you are not near your crockpot while it’s cooking, it should be just fine! At the end of cooking time, Taylor and I like to add additional spices, etc. to our liking! You might add in more coconut sugar for a sweetness, more turmeric for flavor and that yellow curry look, curry powder if your missing that curry flavor you like, and red pepper flakes for some heat! Salt and Pepper to taste of course! 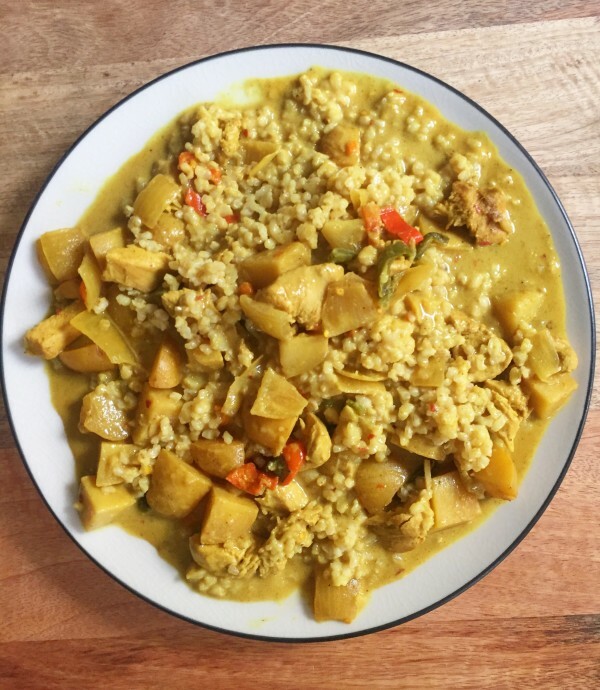 Serve curry over brown rice! and add a squeeze of lime to pull out all of the flavors.